American intercontinental ballistic missile. ICBM, developed also as the launch vehicle for the manned Gemini spacecraft in the early 1960's. When the ICBM's were retired in the 1980's they were refurbished and a new series of launches began. AKA: LGM-25C;Mk. 6;Titan 2;W53. Status: Retired 1976. First Launch: 1962-03-16. Last Launch: 1976-06-28. Number: 81 . Payload: 3,100 kg (6,800 lb). Thrust: 1,893.40 kN (425,653 lbf). Gross mass: 154,000 kg (339,000 lb). Height: 31.40 m (103.00 ft). Diameter: 3.05 m (10.00 ft). Span: 3.05 m (10.00 ft). Apogee: 185 km (114 mi). The Titan 1 ICBM had been developed by Martin and Aerojet as technical insurance if the Atlas, built by Convair and Rocketdyne, had failed. The Martin team had been instructed to use the liquid oxygen/kerosene propellants used for the Atlas, even though Aerojet's prior experience was primarily with storable propellants. As early as 1957 Martin and Aerojet proposed a number of improvements to the basic Titan design, which would make the follow-on missile a much more useful weapon system. Storable propellants would eliminate the loading, just prior to launch, of the cryogenic liquid oxygen needed by the Atlas and Titan 1. A storable-propellant missile could remain fueled, stored in a silo, ready for launch at a moment's notice. The complicated elevator and fuelling apparatus of the immense Titan 1 complexes could be eliminated. The Aerojet storable propellant engines would be immensely simplified compared to the cryogenic Titan 1 engines. A new AC Spark Plug inertial navigation system would make the missile more accurate and impervious to jamming. With the new propellants, and a constant missile diameter, the improved missile would fit in the same silo and transport envelope, but have 50% greater takeoff mass, and nearly triple the payload. The Air Force authorized Martin to proceed with the Titan 2 ICBM in June 1960. In January 1961 the Titan 2 was selected to boost the Dynasoar manned spaceplane on suborbital tests, and in July 1961, to orbit the manned Gemini spacecraft. Therefore during development the ICBM had also to be man-rated. This caused some difficulties, as a pogo problem encountered in flight tests was acceptable to the Air Force for a weapon system, but unacceptable to NASA for a manned booster. The problem was solved to NASA's satisfaction, and the Titan went on to a perfect launch record during the Gemini program. Meanwhile Titan 2's were deployed in 54 fixed silos at three bases by the end of 1964. The missile was equipped with the immense W53 nuclear warhead and penetration aids to ensure that it would get through the evolving Soviet anti-ballistic missile systems around Moscow. Throughout the Cold War, the Titan 2 was the main threat to the Soviet leadership in Moscow, even within their subterranean command bunkers. It represented only 5% of America's ICBM's, but over 30% of the deliverable megatonnage. However solid propellant missiles were more attractive to Defense Secretary McNamara, and the Atlas and Titan 1 ICBM's were all decommissioned by 1966 after short service lives. But the Russians had unveiled their equivalent of the Titan 2, the awesome SS-9 Scarp (R-36) "city buster". It was politically imprudent to decommission the only American equivalent, and so the Titan 2 soldiered on as the only American liquid-propellant ICBM. It was not until 1987 that it was replaced by the solid-propellant Peacekeeper. By then the Cold War had only three more years to run. The Peacekeeper, developed at incredible expense, had a very short service life, being outlawed under missile reduction agreements after a few years service. The decommissioned Titan 2's were refurbished and used as space launchers until the last was finally expended in 2003. Modifications of the Titan 2 continued in production as the core for the Titan 3, 34, and 4 series of space launchers, until the last was finally launched in 2005. During its life the storable propellants, which resulted in a simple and extremely reliable vehicle, became prohibitively expensive. This was because they were toxic, and environmental regulations made them, eventually, unprofitable to produce and difficult to handle. Outside of the United States the forces of Environmental Correctness were not as strong. The same propellants continued in use into the 21st Century in the Ariane 4 boosters for France, the GSLV for India, the Proton and Dnepr of Russia, and the CZ series in China. LEO Payload: 3,100 kg (6,800 lb) to a 185 km orbit. Development Cost $: 400.000 million. Recurring Price $: 16.389 million in 1969 dollars. Flyaway Unit Cost 1985$: 3.158 million in 1963 dollars. Maximum range: 11,690 km (7,260 mi). Number Standard Warheads: 1. Standard RV: Mk. 6. Standard warhead: W53. Warhead yield: 8,900 KT. CEP: 1.61 km (1.00 mi). Maximum speed: 29,030 kph (18,030 mph). Initial Operational Capability: 1963. Total Number Built: 131. Total Development Built: 23. Total Production Built: 108. Stage 2. 1 x Titan 2-2. Gross Mass: 28,939 kg (63,799 lb). Empty Mass: 2,404 kg (5,299 lb). Thrust (vac): 444.819 kN (99,999 lbf). Isp: 316 sec. Burn time: 180 sec. Isp(sl): 160 sec. Diameter: 3.05 m (10.00 ft). Span: 3.05 m (10.00 ft). Length: 7.86 m (25.78 ft). Propellants: N2O4/Aerozine-50. No Engines: 1. Engine: LR-91-7. Status: Out of Production. Family: ICBM, silo-launched. Country: USA. Engines: LR87-7, LR91-7, LR91-5, LR87-5, SR51, SR55. Spacecraft: Gemini, Gemini Fuel Cell, Gemini LOR, Mercury Mark I, G4C, Dynasoar, G5C, MOL, Tiros N, DMSP Block 5D-2, Advanced Tiros N, Singleton, Landsat 6, Clementine, QuikScat, DMSP Block 5D-3, Coriolis. Launch Sites: Cape Canaveral, Vandenberg, Cape Canaveral LC15, Cape Canaveral LC16, McConnell AFB, Little Rock AFB, Davis-Monthan AFB, Vandenberg 395-C, Vandenberg 395-D, Vandenberg 395-B. Stages: Titan 2-1, Titan 2-2. Agency: Martin. 1958 July - . LV Family: Titan. Launch Vehicle: Titan II. Advanced Titan considered. - . Nation: USA. USAF reviews improvements (inertial guidance, storable fuel, 1 x 9 basing, both stages constant 3.05 m diameter, in silo launch) to the Titan I..
1959 January 19 - . LV Family: Titan. Launch Vehicle: Titan II. Silo-launched Titan approved. - . Nation: USA. Major General Schriever approves conversion of future Titan facilities from silo-lift to in-silo launch..
1959 March 25 - . LV Family: Titan. Launch Vehicle: Titan II. Non-cryogenic propellants for Titan - . AFBMD recommended that non-cryogenic propellants be introduced into the Titan program with the seventh squadron..
1959 Apr - . LV Family: Titan. Launch Vehicle: Titan II. Contractor for Titan all-inertial guidance system. - . AC Spark Plug was selected as the contractor to build the Titan all-inertial guidance system..
1959 June 30 - . LV Family: Titan. Launch Vehicle: Titan II. Nitrogen tetroxide oxidizer and the Aerozine-50 fuel blend selected for Titan II. - . Studies of possible non-cryogenic propellants for use on Titan indicated that the most promising combination was a nitrogen tetroxide oxidizer and the Aerozine-50 fuel blend..
1959 August 17 - . LV Family: Titan. Launch Vehicle: Titan II. In-silo launch capability for Titan missiles beginning in October 1962. - . The Department of Defense and the Air Force Ballistic Missile Committee approved an in-silo launch capability for Titan missiles beginning with the seventh squadron (October 1962). As a result of changes initiated during 1959, the Titan missiles from the seventh squadron on would have all-inertial guidance systems, storable non-cryogenic propellants, and an in-silo launch capability. 1959 September 9 - . LV Family: Titan. Launch Vehicle: Titan II. Titan II would commence with the seventh Titan squadron. - . Secretary of the Air Force James H. Douglas, Jr., recommended approval of the Titan II (WS 107C) program that would commence with the seventh squadron to be deployed to SAC. The Titan II would be an advanced system, with all-inertial guidance, non-cryogenic propellants, and in-silo launch capability for vastly improved reaction time and reduced vulnerability through hardened and dispersed (H&D) configurations. 1959 December 1 - . LV Family: Titan. Launch Vehicle: Titan II. Titan II authorized - . Headquarters USAF authorized the initiation of development for an improved Titan missile, the Titan II..
1960 Jan - . LV Family: Titan. Launch Vehicle: Titan II. Contracts for Titan II engines. - . AFBMD awarded contracts for development of first and second stage Titan engines that would use non-cryogenic (storable) pro-pellants. Aerozine 50 (50 per cent UDMH and 50 per cent hydrazine) was the fuel selected to be used with nitrogen tetroxide as the oxidizer. 1960 March 1 - . LV Family: Titan. Launch Vehicle: Titan II. 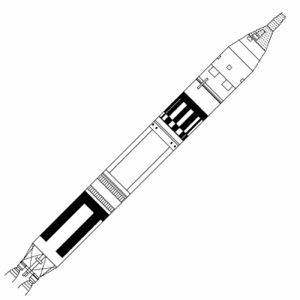 Titan II RV and basing decisions - . Two important decisions were made on the Titan II program during the month. AFBMD received program approval to proceed with the development of the Mark 6 reentry vehicle specifically for use on the Titan II. Configuration for the Titan II operational squadrons was set at nine hardened and dispersed underground silo missile launchers (1x9) in strategic missile wings of two squadrons each (18 missile launchers). 1960 May - . LV Family: Titan. Launch Vehicle: Titan II. Contract for production of the Titan II. - . The Air Force gave the Martin Company a letter contract for development, captive and flight testing, and production of the Titan II (WS 107C)..
1960 June - . LV Family: Titan. Launch Vehicle: Titan II. Martin awarded a contract to develop the Titan 2 ICBM. - . Nation: USA. 1960 Jun - . Launch Site: Little Rock AFB. LV Family: Titan. Launch Vehicle: Titan II. Little Rock AFB site for the 11th and 12th Titan squadrons. - . The Defense Department announced the selection of Little Rock AFB, Arkansas, as the site for the 11th and 12th Titan operational squadrons..
1960 June 20 - . LV Family: Titan. Launch Vehicle: Titan II. Production contract for Titan II - . The Air Force (AFBMD) placed a production contract with the Martin Company for the Titan II (SM-68B) ICBM. This was designed to use storable, non-cryogenic fuels, an all-inertial guidance system, in-silo launch facilities, and to have greater range and payload capabilities than the Titan I (SM-68). 1960 July 26 - . LV Family: Titan. Launch Vehicle: Titan II. Mark 6 reentry vehicle for the Titan II. - . General Electric was awarded the contract to develop the Mark 6 reentry vehicle for the Titan II..
1960 Sep - . LV Family: Titan. Launch Vehicle: Titan II. Titan II prototype booster and sustainer engines built. - . Aerojet-General Corporation completed fabrication of the Titan II (XLGM-25C) prototype booster (XLR 87-AJ-5) and sustainer (XLR 91-AJ-5) engines..
1960 Nov - . LV Family: Titan. Launch Vehicle: Titan II. First full-duration test firing of the Stage II engine for the Titan II ICBM. - . Aerojet-General conducted the first successful, full-duration test firing of the XLR91-AJ-5 Stage II engine intended for use in the advanced Titan II ICBM..
1961 Jan - . LV Family: Titan. Launch Vehicle: Titan II. First production R&D Stage II engine for Titan II - . The first production R&D XLR91-AJ-5 Stage II engine for Titan II was delivered by Aerojet-General..
1961 Mar - . LV Family: Titan. Launch Vehicle: Titan II. First full-duration test of the Stage I engine for the Titan II - . The first successful, full-duration test of the XLR87-AJ-5 Stage I engine for the Titan II was completed..
1961 March 28 - . LV Family: Titan, Minuteman. Launch Vehicle: Titan II. Titan force reduced from 14 to 12 squadrons. - . Related Persons: , Kennedy. President John F. Kennedy reduced the FY 1962 budget for the Titan force from 14 to 12 squadrons. Accordingly, the Air Force Ballistic Missile Committee cancelled the two Titan II squadrons planned for Griffiss AFB, New York. In addition, the President deferred the current plans for three mobile Minuteman missile squadrons. 1961 Jun - . LV Family: Titan. Launch Vehicle: Titan II. First production R&D Stage I engine for the Titan II - . The first production model R&D XLR87-AJ-5 Stage I engine for the Titan II were delivered..
1961 Jul - . LV Family: Titan. Launch Vehicle: Titan II. First production Stage I engine for Titan II. - . Aerojet-General delivered the first production XLR87-AJ-5 Stage I engine for Titan II..
1961 Aug - . LV Family: Titan. Launch Vehicle: Titan II. First production Stage II engine for Titan II - . The first production XLR91-AJ-5 Stage II engine for Titan II was delivered by Aerojet-General..
1961 August 3 - . LV Family: Titan. Launch Vehicle: Titan II. Martin briefed Space Task Group on Titan II technical characteristics and performance. - . Nation: USA. Representatives of Martin Company briefed Director Robert R. Gilruth and some of the senior staff of Space Task Group on Titan II technical characteristics and expected performance. At a senior staff meeting four days later, August 7, Gilruth commented on the Titan II's promise for manned spaceflight, particularly its potential ability to place larger payloads in orbit than could Atlas, which would make it 'a desirable booster for a two-man spacecraft.' Martin had estimated the cost of procuring and launching nine Titan II boosters, with cost of ancillary equipment, at $47.889 million spread over fiscal years 1962 through 1964. 1961 August 8 - . LV Family: Titan. Launch Vehicle: Titan II. First Titan II production engine delivered - . The first Titan II production engine was delivered to the Air Force..
1961 October - . LV Family: Titan. Launch Vehicle: Titan II. Titan II to be selected as the launch vehicle for NASA's advanced Mercury. - . Nation: USA. Spacecraft: Gemini. Martin Company received informal indications from the Air Force that Titan II would be selected as the launch vehicle for NASA's advanced Mercury. Martin, Air Force, and NASA studied the feasibility of modifying complex 19 at Cape Canaveral from the Titan weapon system configuration to the Mercury Mark II launch vehicle configuration. 1961 October 27 - . LV Family: Titan. Launch Vehicle: Titan II. First Titan II missiles delivered. - . The Air Force accepted the first Titan II (XLGM-25C) missiles..
1961 December 5 - . LV Family: Titan. Launch Vehicle: Titan II. Titan II for the Mercury Mark II - . Nation: USA. Related Persons: McNamara. Spacecraft: Gemini. Recommendation that the weapon system of the Titan II, with minimal modifications, be approved for the Mercury Mark II rendezvous mission. On the basis of a report of the Large Launch Vehicle Planning Group, Robert C. Seamans, Jr., NASA Associate Administrator, and John H. Rubel, Department of Defense Deputy Director for Defense Research and Engineering, recommended to Secretary of Defense Robert S. McNamara that the weapon system of the Titan II, with minimal modifications, be approved for the Mercury Mark II rendezvous mission. The planning group had first met in August 1961 to survey the Nation's launch vehicle program and was recalled in November to consider Titan II, Titan II-1/2, and Titan III. On November 16, McNamara and NASA Administrator James E. Webb had also begun discussing the use of Titan II. Titan II to be used for the Mercury Mark II program. - . Nation: USA. Manned Spacecraft Center directed Air Force Space Systems Division to authorize contractors to begin the work necessary to use the Titan II in the Mercury Mark II program. On December 27, Martin-Baltimore received a go-ahead on the launch vehicle from the Air Force. A letter contract for 15 Gemini launch vehicles and associated aerospace ground equipment followed on January 19, 1962. 1961 December 28 - . LV Family: Titan. Launch Vehicle: Titan II. Titan 2 first ground test. - . Nation: USA. Class: Manned. Type: Manned spacecraft. Spacecraft: Gemini. Titan II, an advanced ICBM and the booster designated for NASA's two-man orbital flights, was successfully captive-fired for the first time at the Martin Co.'s Denver facilities. The test not only tested the flight vehicle but the checkout and launch equipment intended for operational use. Titan 2 first static ground test. - . Nation: USA. Titan 2 was successfully captive-fired for the first time at the Martin Co.'s Denver facilities..
Titan II captive-fired for the first time - . A Titan II was successfully captive-fired for the first time at Martin's test stand facilities near Denver, Colorado..
1962 January 1 - . Launch Site: Davis-Monthan AFB. Launch Complex: Davis-Monthan AFB. LV Family: Titan. Launch Vehicle: Titan II. Davis-Monthan AFB - . Nation: USA. Titan 2 390th SMW and 570th SMS (9 missiles) activated at Davis-Monthan AFB, Arizona..
1962 January 3 - . LV Family: Titan. Launch Vehicle: Titan II. Statement of Work for the procurement of Titan II launch vehicles for the Gemini program. - . Nation: USA. Manned Spacecraft Center prepared a Statement of Work to be accomplished by Air Force Space Systems Division (SSD) in its role as contractor to NASA for the procurement of Titan II launch vehicles for the Gemini program. The launch vehicle would retain the general aerodynamic shape, basic systems, and propulsion concepts of the missile. Modifications, primarily for crew safety, were to be kept to a minimum. The Statement of Work accompanied a purchase request for $27 million, dated January 5, 1962, for 15 Titan launch vehicles. Pending ratification of the Gemini Operational and Management Plan, however, funding was limited to $3 million. To oversee this work, SSD established a Gemini Launch Vehicle Directorate, headed by Colonel Richard C. Dineen, on January 11. Initial budgeting and planning were completed by the end of March, and a final Statement of Work was issued May 14; although amended, it remained in effect throughout the program. 1962 January 11 - . LV Family: Titan. Launch Vehicle: Titan II. Gemini Launch Vehicle Directorate established. - . Spacecraft: Gemini. Headquarters Space Systems Division established the Gemini Launch Vehicle Directorate (SSVL) under Colonel R.C. Dineen as part of the Deputy for Launch Vehicles (SSV)..
1962 January 26 - . LV Family: Titan. Launch Vehicle: Titan II. Titan II plans to ensure flight safety and enhance reliability. - . Nation: USA. After investigating potential malfunction problems of the modified Titan II/Gemini launch vehicle, Martin-Baltimore prepared a study report with plans to provide the components necessary to ensure flight safety and enhance reliability. Martin defined the malfunction problem quantitatively in terms of the probability of each cause and its characteristic effect on the system and vehicle. Martin intended to keep the launch vehicle as much like the weapon system as possible; thus the data obtained from the Air Force's weapon system development program would be applicable to the launch vehicle. Only minimal modifications to enhance probability of mission success, to increase pilot safety, and to accommodate the Gemini spacecraft as the payload were to be made. These included a malfunction detection system; backup guidance, control, and hydraulic systems; and selective electrical redundancies. 1962 February 15 - . LV Family: Titan. Launch Vehicle: Titan II. Aerospace Corporation to support of the Gemini Launch Vehicle Program. - . Nation: USA. Air Force Space Systems Division issued a Technical Operating Plan to Aerospace Corporation, El Segundo, California, for support of the Gemini Launch Vehicle Program; a contract followed on March 15. Aerospace was to assume responsibility for general systems engineering and technical direction of the development of the launch vehicle and its associated subsystems. Aerospace had already established a Gemini Launch Vehicle Program Office in January. 1962 February 16 - . Launch Site: , Vandenberg. LV Family: Titan. Launch Vehicle: Titan II. Titan II explodes in first silo test - . The 6595th Aerospace Test Wing at Vandenberg AFB conducted the first and development test missile (N-7) from an underground silo. In this first silo launch of a Titan II, the missile destroyed itself . 1962 February 22 - . LV Family: Titan. Launch Vehicle: Titan II. Proposal for redundant subsystems for the Gemini launch vehicle. - . Nation: USA. Spacecraft: Gemini, Gemini Inertial Guidance System. Martin-Baltimore submitted its initial proposal for the redundant flight control and hydraulic subsystems for the Gemini launch vehicle; on March 1, Martin was authorized to proceed with study and design work. The major change in the flight control system from Titan II missile to Gemini launch vehicle was substitution of the General Electric Mod IIIG radio guidance system (RGS) and Titan I three-axis reference system for the Titan II inertial guidance system. Air Force Space Systems Division issued a letter contract to General Electric Company, Syracuse, New York, for the RGS on June 27. Technical liaison, computer programs, and ground-based computer operation and maintenance were contracted to Burroughs Corporation, Paoli, Pennsylvania, on July 3. 1962 March 1 - . Launch Site: McConnell AFB. Launch Complex: McConnell AFB. LV Family: Titan. Launch Vehicle: Titan II. McConnell AFB - . Nation: USA. Titan 2 381st SMW and 532nd SMS (9 missiles) activated at McConnell AFB, Kansas..
1962 March 16 - . 18:09 GMT - . Launch Site: Cape Canaveral. Launch Complex: Cape Canaveral LC16. LV Family: Titan. Launch Vehicle: Titan II. Mk 6 re-entry vehicle test launch - . Nation: USA. Agency: USAF. Apogee: 1,300 km (800 mi). The 6555th Aerospace Test Wing launched the first Titan II (XLGM-25C) research and development flight test missile (N-2) from Cape Canaveral. The Titan II was the most powerful ICBM yet launched by the U.S., its first stage engines generating 430,000 pounds of thrust and the second stage engine 100,000 pounds. The flight of N-2 also marked the first successful test of the AC Spark Plug inertial guidance system. The Air Force successfully launched a Titan II intercontinental ballistic missile. This was the first full-scale test of the vehicle; it flew 8000 km out over the Atlantic Ocean. 1962 March 21 - . LV Family: Titan. Launch Vehicle: Titan II. Contract to Aerojet-General for 15 propulsion systems for the Gemini launch vehicle. - . Nation: USA. Air Force Space Systems Division awarded a letter contract to Aerojet-General Corporation, Azusa, California, for the research, development, and procurement of 15 propulsion systems for the Gemini launch vehicle. It also included the design and development of the related aerospace ground equipment. Aerojet had been authorized to go ahead with work on the engines on February 14, 1962, and the final engine was scheduled for delivery by April 1965. 1962 March 23 - . LV Family: Titan. Launch Vehicle: Titan II. Development Plan for the Gemini Launch Vehicle - . Nation: USA. Air Force Space Systems Division published the "Development Plan for the Gemini Launch Vehicle System". From experience in Titan II and Mercury programs, the planners estimated a budget of $164.4 million, including a 50 percent contingency for cost increases and unforeseen changes. 1962 March 30 - . LV Family: Titan. Launch Vehicle: Titan II. 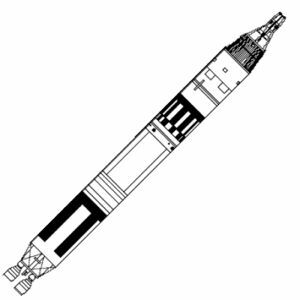 Design philosophy for Gemini Titan II - . Nation: USA. Martin-Baltimore submitted a "Description of the Launch Vehicle for the Gemini Spacecraft" to Air Force Space Systems Division. This document laid the foundation for the design of the Gemini launch vehicle by defining the concept and philosophy of each proposed subsystem. 1962 April 1 - . Launch Site: Little Rock AFB. Launch Complex: Little Rock AFB. LV Family: Titan. Launch Vehicle: Titan II. Little Rock AFB - . Nation: USA. Titan 2 308th SMW and 373rd SMS (9 missiles) activated at Little Rock AFB, Arkansas. 1962 May 1 - . Launch Site: Davis-Monthan AFB. Launch Complex: Davis-Monthan AFB. LV Family: Titan. Launch Vehicle: Titan II. Davis-Monthan AFB - . Nation: USA. Titan 2 571st SMS (9 missiles) activated within the 390th SMW at Davis-Monthan AFB, Arizona..
1962 May 16-17 - . LV Family: Titan. Launch Vehicle: Titan II. A Launch Vehicle-Spacecraft Interface Working Group was established. - . Nation: USA. Gemini Project Office (GPO) and Aerospace had agreed on the need for such a group at a Gemini-Titan coordination meeting on May 11. The main function of the group, composed of Martin and McDonnell personnel with a McDonnell representative as chairman, was to provide mutual exchange of design and physical data on mechanical, electrical, and structural details between the spacecraft contractor and the booster contractor. The group would make no policy decisions; its actions were to be reviewed at regularly scheduled coordination meetings held by GPO. 1962 May 21 - . LV Family: Titan. Launch Vehicle: Titan II. Contract to convert pad 19 at Cape Canaveral for Gemini flights. - . Nation: USA. Amendment No. 6 to the Gemini launch vehicle procurement contract assigned $2.609 million to fund the construction necessary to convert pad 19 at Cape Canaveral for Gemini flights. The Air Force had originally constructed pad 19 for the Titan I development program. Following the final Titan I development flight (January 29) from the Cape, design of the required modifications had begun in February. In April, Gemini Project Office decided that Pad 19 would have an erector rather than a gantry, the upper third of which would be designed as a white room. The final design review of pad 19 modifications took place July 9-10, and the Army Corps of Engineers awarded the construction contract to Consolidated Steel, Cocoa Beach, Florida. Construction began in September. Work was completed and pad 19 was activated on October 17, 1963. 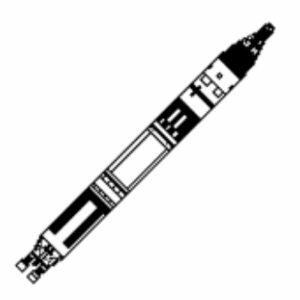 Avco proposal for Titan-launched space station. - . Nation: USA. Avco's proposed station design comprised three separate tubes about 3 m in diameter and 6 m long, launched separately aboard Titan 2s and joined in a triangular shape in orbit. A standard Gemini spacecraft was to serve as ferry vehicle..
1962 June 7 - . 18:21 GMT - . Launch Site: Cape Canaveral. Launch Complex: Cape Canaveral LC15. LV Family: Titan. Launch Vehicle: Titan II. Mk 6 re-entry vehicle test launch - . Nation: USA. Agency: USAF AFSC. Apogee: 1,300 km (800 mi). 1962 June 30 - . LV Family: Titan. Launch Vehicle: Titan II. Martin-Baltimore's airborne systems functional test stand went into operation at Baltimore. - . Nation: USA. In this 3000-square-foot facility, all airborne systems in the Gemini launch vehicle - including flight control, hydraulic, electrical, instrumentation, and malfunction detection - were assembled on tables and benches; actual engines, but simulated propellant tanks and guidance, were used. In addition to individual and combined systems tests, the facility was used to check system design changes and trouble-shoot problems encountered in other test programs. 1962 July 6 - . LV Family: Titan. Launch Vehicle: Titan II. Plan for flight testing the malfunction detection system (MDS) for the Gemini launch vehicle. - . Nation: USA. Martin prepared a plan for flight testing the malfunction detection system (MDS) for the Gemini launch vehicle on development flights of the Titan II weapon system. Gemini Project Office (GPO) had requested Martin to prepare Systems Division and Aerospace approved the plan and won GPO concurrence early in August. This so-call 'piggyback plan' required installing the Gemini MDS in Titan II engines on six Titan II flights to demonstrate its reliability before it was flown on Gemini. 1962 July 11 - . 18:51 GMT - . Launch Site: Cape Canaveral. Launch Complex: Cape Canaveral LC15. LV Family: Titan. Launch Vehicle: Titan II. 1962 July 12 - . LV Family: Titan. Launch Vehicle: Titan II. Gemini-Titan Launch Operations Committee. - . Nation: USA. A technical team at Air Force Missile Test Center, Cape Canaveral, Florida - responsible for detailed launch planning, consistency of arrangements with objectives, and coordination - met for the first time with official status and a new name. The group of representatives from all organizations supplying major support to the Gemini-Titan launch operations, formerly called the Gemini Operations Support Committee, was now called the Gemini-Titan Launch Operations Committee. 1962 July 25-26 - . LV Family: Titan. Launch Vehicle: Titan II. Reliability review of the Titan II launch vehicle engine system. - . Nation: USA. A reliability review of the Titan II launch vehicle engine system was held in Sacramento, California, at Aerojet-General's Liquid Rocket Plant, the site where the engines were being developed. Gemini engines had to be more reliable than did intercontinental ballistic missile (ICBM) engines. This requirement meant supplementing the ICBM engine reliability program, a task being performed by Aerojet under Air Force Space Systems Division direction. 1962 July 25 - . 16:17 GMT - . Launch Site: Cape Canaveral. Launch Complex: Cape Canaveral LC16. LV Family: Titan. Launch Vehicle: Titan II. 1962 August 1 - . Launch Site: McConnell AFB. Launch Complex: McConnell AFB. LV Family: Titan. Launch Vehicle: Titan II. McConnell AFB - . Nation: USA. Titan 2 533rd SMS (9 missiles) activated within the 381st SMW at McConnell AFB, Kansas..
1962 August 31 - . Launch Site: Davis-Monthan AFB. LV Family: Titan. Launch Vehicle: Titan II. First Titan II operational missile was accepted by the Air Force. - . The first Titan II (LGM-25C) operational missile was accepted by the Air Force. This missile was delivered to Davis-Monthan AFB, Arizona, on 11 December 1962..
1962 September 1 - . Launch Site: Little Rock AFB. Launch Complex: Little Rock AFB. LV Family: Titan. Launch Vehicle: Titan II. Little Rock AFB - . Nation: USA. Titan 2 374th SMS (9 missiles) activated within the 308th SMW at Little Rock AFB, Arkansas. 1962 September 12 - . 15:50 GMT - . Launch Site: Cape Canaveral. Launch Complex: Cape Canaveral LC15. LV Family: Titan. Launch Vehicle: Titan II. 1962 October 1 - . LV Family: Titan. Launch Vehicle: Titan II. Air Force Space Systems Division revised the Development Plan for the Gemini launch vehicle. - . Nation: USA. The budget was raised to $181.3 million. Cost increases in work on the vertical test facility at Martin's Baltimore plant, on the conversion of pad 19 at Cape Canaveral, and on aerospace ground equipment had already generated a budget increase to $172.6 million during September. The new Development Plan also indicated that the first launch date had slipped to December 1963. 1962 October 12 - . 16:24 GMT - . Launch Site: Cape Canaveral. Launch Complex: Cape Canaveral LC16. LV Family: Titan. Launch Vehicle: Titan II. 1962 October 26 - . 17:05 GMT - . Launch Site: Cape Canaveral. Launch Complex: Cape Canaveral LC15. LV Family: Titan. Launch Vehicle: Titan II. 1962 November - . LV Family: Titan. Launch Vehicle: Titan II. Contract for Phase I of the Gemini launch vehicle program. - . Nation: USA. During the first three weeks of the month, Air Force Space Systems Division and Martin-Baltimore negotiated the terms of the contract for Phase I of the Gemini launch vehicle program. The resulting cost-plus-fixed-fee contract included an estimated cost of $52.5 million and a fixed fee of $3.465 million. This contract covered the development and procurement of the first launch vehicle and preparations for manufacturing and procuring the remaining 14 vehicles required by the Gemini program. 1962 December - . LV Family: Titan. Launch Vehicle: Titan II. Aerojet-General contract for the first phase of the Gemini launch vehicle engine program. - . Nation: USA. Air Force Space Systems Division and Aerojet-General negotiated a cost-plus-fixed-fee contract for the first phase of the Gemini launch vehicle engine program, February 14, 1962, through June 30, 1963. The contract required delivery of one set of engines, with the remaining 14 sets included for planning purposes. Estimated cost of the contract was $13.9 million, with a fixed fee of $917,400 for a total of $14,817,400. 1962 December 6 - . 20:31 GMT - . Launch Site: Cape Canaveral. Launch Complex: Cape Canaveral LC16. LV Family: Titan. Launch Vehicle: Titan II. FAILURE: Failure. Mk 4 re-entry vehicle test - . Nation: USA. Agency: USAF AFSC. Apogee: 500 km (310 mi). Titan II flight N-11, the eighth in a series being conducted by the Air Force to develop the weapon system, was launched from Cape Canaveral. It carried a design change intended to reduce the amplitude of longitudinal oscillations which had appeared during first stage operation on all seven previous Titan II flights. This phenomenon, which subsequently became known as POGO, generated g-forces as high as nine in the first stage and over three at the position on the missile corresponding to the location of the spacecraft on the Gemini launch vehicle. Fearing the potentially adverse effect on astronaut performance of such superimposed g-forces, NASA established 0.25g at 11 cycles per second as the maximum level tolerable for Gemini flights. As a first try at solving the POGO problem, Titan II N-11 carried standpipes in each leg of the stage I oxidizer feed lines to interrupt the coupling between the missile's structure and its propulsion system. This coupling was presumed to be the cause of the instability. Postflight analysis, however, revealed that the POGO fix was unsuccessful; longitudinal oscillation had actually been multiplied by a factor of two. 1962 December 19 - . 20:08 GMT - . Launch Site: Cape Canaveral. Launch Complex: Cape Canaveral LC15. LV Family: Titan. Launch Vehicle: Titan II. 1962 December 26 - . LV Family: Titan. Launch Vehicle: Titan II. Gemini Launch Vehicle Configuration Control Board. - . Nation: USA. Air Force Space Systems Division established the Gemini Launch Vehicle Configuration Control Board to draw up and put into effect procedures for approving and disapproving specifications and engineering change proposals for the Gemini launch vehicle. It formally convened for the first time on March 5, 1963. 1962 December 27 - . Launch Site: Davis-Monthan AFB. LV Family: Titan. Launch Vehicle: Titan II. First operational Titan II missile installed at Davis-Monthan AFB. - . The first operational Titan II (LGM-25C) missile was installed in the lead complex of the 570th Strategic Missile Squadron at Davis-Monthan AFB, Arizona. This was a major milestone in the transition of the Titan II from research and development to fully operational status with the Strategic Air Command. 1963 January 10 - . Launch Site: Cape Canaveral. Launch Complex: Cape Canaveral LC16. LV Family: Titan. Launch Vehicle: Titan II. FAILURE: Failure. Mk 6 re-entry vehicle test launch - . Nation: USA. Agency: USAF AFSC. Apogee: 500 km (310 mi). 1963 January 29-30 - . LV Family: Titan. Launch Vehicle: Titan II. Titan II development flight failures caused by problems in the airborne radio guidance system. - . Nation: USA. 1963 February 6 - . 17:59 GMT - . Launch Site: Cape Canaveral. Launch Complex: Cape Canaveral LC15. LV Family: Titan. Launch Vehicle: Titan II. Mk 6 re-entry vehicle test launch - . Nation: USA. Agency: USAF AFSC. Apogee: 1,300 km (800 mi). A Titan II (N-16) completed a 6,500-mile flight down the Atlantic Missile Range carrying the heaviest payload ever to travel that far on a U.S. missile..
1963 February 16 - . 21:45 GMT - . Launch Site: Vandenberg. Launch Complex: Vandenberg 395-C. LV Family: Titan. Launch Vehicle: Titan II. FAILURE: Failure. Awful Tired - . Nation: USA. Agency: USAF AFSC. Apogee: 5.00 km (3.10 mi). Research and development launch - Mk 6 re-entry vehicle. 1963 February 18 - . LV Family: Titan. Launch Vehicle: Titan II. Pilot safety philosophy and procedures would be carried over from Mercury-Atlas to Gemini-Titan. - . Nation: USA. 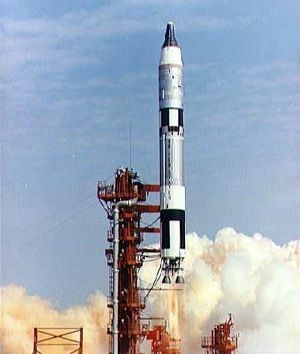 In a letter transmitting copies of the Gemini Launch Vehicle Pilot Safety Program to Gemini contractors and other organizations engaged in Gemini development and operations, Air Force Space Systems Division explained that pilot safety philosophy and procedures would be carried over from Mercury-Atlas to Gemini-Titan. 1963 March 1 - . LV Family: Titan. Launch Vehicle: Titan II. Gemini launch vehicle (GLV) 1 to use GLV 2 tank - . Nation: USA. 1963 March 7 - . LV Family: Titan. Launch Vehicle: Titan II. Study group to recommend DOD experiments for inclusion in the Gemini flight program. - . Nation: USA. The Gemini Program Planning Board, meeting in Washington, agreed to the establishment of an ad hoc study group to compare NASA and Department of Defense (DOD) objectives for the Gemini program and to recommend DOD experiments for inclusion in the Gemini flight program. The group met in continuous session March 25 to April 26, presenting its final report to the board on May 6. The board then recommended that a program of inflight military experiments be immediately approved, that the Air Force establish a field office at Manned Spacecraft Center to manage DOD participation in the Gemini program in general and integration of experiments in particular, and that work on preventing longitudinal oscillations in stage I and combustion instability in stage II of the Gemini launch vehicle to be urgently pursued. The board declined to recommend additional flights in the Gemini program, as suggested by the study group, to encompass experiments that would not fit into the framework of the planned Gemini program. The Secretary of Defense and NASA Administrator concurred in the Board's recommendations. 1963 March 21 - . 15:23 GMT - . Launch Site: Cape Canaveral. Launch Complex: Cape Canaveral LC15. LV Family: Titan. Launch Vehicle: Titan II. 1963 April 1 - . LV Family: Titan. Launch Vehicle: Titan II. POGO problems in the Titan II. - . Nation: USA. The Titan II-Gemini Coordination Committee was established to direct efforts to reduce longitudinal vibration (POGO) in the Titan II and to improve engine reliability. Air Force Space Systems Division (SSD) and Aerospace had presented to NASA and the Air Force a series of briefings on the POGO problem that culminated in a briefing to the Gemini Program Planning Board. The main problem was that POGO level satisfactory in the weapon system was too high to meet NASA standards for the Gemini program, and further reduction in the POGO level required a much more elaborate and extensive analytic and experimental program than had so far been considered necessary. The board approved the SSD/Aerospace proposals and established a committee to oversee work toward a POGO remedy. The high-level committee was composed of officials from Air Force Ballistic Systems Division, SSD, Space Technology Laboratories, and Aerospace. 1963 April 3 - . Launch Site: McConnell AFB. LV Family: Titan. Launch Vehicle: Titan II. All major site construction on the Titan II force completed. - . All major site construction on the Titan II force was completed at Davis-Monthan AFB, Arizona; Little Rock AFB, Arkansas; and McConnell AFB, Kansas..
1963 April 19 - . Launch Site: Cape Canaveral. Launch Complex: Cape Canaveral LC15. LV Family: Titan. Launch Vehicle: Titan II. FAILURE: Failure. Research and development test - . Nation: USA. Agency: USAF AFSC. Apogee: 500 km (310 mi). Mk 6 re-entry vehicle. 1963 April 23-24 - . LV Family: Titan. Launch Vehicle: Titan II. Gemini successful crew escape possible based on Titan II tests. - . Nation: USA. The Gemini Abort Panel met. Martin-Baltimore's analysis of the last three Titan II flight tests tended to show that successful crew escape would have been possible. McDonnell presented data on spacecraft structural capabilities, but lack of data on what to expect from Titan II catastrophic failure meant that spacecraft structural capabilities remained a problem. Also some questions had existed as to what could happen to the adapter retrosection during and after an abort. A study had been made of this problem, assuming a 70,000 foot altitude condition, and there appeared to be no separation difficulties. This study investigated the period of up to 10 seconds after separation, and there was no evidence that recontact would occur. 1963 April 27 - . Launch Site: Vandenberg. Launch Complex: Vandenberg 395-C. LV Family: Titan. Launch Vehicle: Titan II. Dinner Party - . Nation: USA. Agency: USAF AFSC. Apogee: 1,300 km (800 mi). Titan II (N-8) was the second research and development missile and the first successful flight test vehicle to be launched from a silo at Vandenberg AFB. This was the first successful Titan II launch and flight after three consecutive failures, one (N-7) at Vandenberg and two (N-18 and N-21) at the Atlantic range. Research and development launch. Mk 6 re-entry vehicle. 1963 May 6 - . LV Family: Titan. Launch Vehicle: Titan II. Gemini/Titan II improvement program. - . Nation: USA. The Gemini Program Planning Board approved the Air Force Systems Command development plan for the Gemini/Titan II improvement program. The plan covered the development work required to man-rate the Titan II beyond the requirements of the Titan II weapon system and included three major areas: (1) reducing longitudinal oscillation levels to NASA requirements, (2) reducing the incidence of stage II engine combustion instability, and (3) cleaning up the design of stage I and II engines and augmenting the continuing engine improvement program to enhance engine reliability. The work was to be funded by the Titan Program Office of Air Force Ballistics Systems Division and managed by the Titan II/Gemini Coordination Committee, which had been established April 1. NASA found the plan satisfactory. 1963 May 7-17 - . LV Family: Titan. Launch Vehicle: Titan II. First engines for Gemini launch vehicle No. 1 - . Nation: USA. 1963 May 9 - . Launch Site: Cape Canaveral. Launch Complex: Cape Canaveral LC16. LV Family: Titan. Launch Vehicle: Titan II. FAILURE: Failure. Research and development test - . Nation: USA. Agency: USAF AFSC. Apogee: 1,000 km (600 mi). Mk 6 re-entry vehicle..
1963 May 24 - . 17:33 GMT - . Launch Site: Cape Canaveral. Launch Complex: Cape Canaveral LC15. LV Family: Titan. Launch Vehicle: Titan II. Research and development test - . Nation: USA. Agency: USAF AFSC. Apogee: 1,300 km (800 mi). Mk 6 re-entry vehicle. 1963 May 29 - . LV Family: Titan. Launch Vehicle: Titan II. The vertical test facility (VTF) at Martin-Baltimore was activated. - . Nation: USA. 1963 May 29 - . 16:56 GMT - . Launch Site: Cape Canaveral. Launch Complex: Cape Canaveral LC16. LV Family: Titan. Launch Vehicle: Titan II. FAILURE: Failed 55 seconds after launch.. Failed Stage: 1. Research and development test - . Nation: USA. Agency: USAF AFSC. Titan II flight N-20, the 19th in the series of Air Force research and development flights, was launched from Cape Canaveral. It carried oxidizer standpipes and fuel accumulators to suppress longitudinal oscillations (POGO). During the spring of 1963, static firings of this configuration had been successful enough to confirm the hypothesis that POGO was caused by coupling between the missile structure and its propulsion system, resulting in an unstable closed loop system. Standpipes and accumulators, by interrupting the coupling reduced the source of instability. Flight N-20 failed 55 seconds after launch and yielded no POGO data. Although the failure was not attributed to the installed POGO fix, Air Force Ballistics Systems Division decided officially that no further Titan II development flights would carry the POGO fix because so few test flights remained to qualify the weapon system operationally. This decision did not stand, however, and the POGO fix was flown again on N-25 (November 1), as well as on two later flights. 1963 June 2 - . LV Family: Titan. Launch Vehicle: Titan II. Stage I of Gemini launch vehicle 1 was erected in Martin-Baltimore's vertical test facility. - . Nation: USA. Stage II was erected on June 9, and posterection inspection was completed June 12. Subsystem Functional Verification Tests began June 10..
1963 June 8 - . Launch Site: Davis-Monthan AFB. LV Family: Titan. Launch Vehicle: Titan II. First Titan II operational squadron activated. - . The first Titan II operational squadron, the 570th Strategic Missile Squadron, was activated at Davis-Monthan AFB, Arizona, and assigned to SAC's 390th Strategic Missile Wing..
1963 June 13 - . LV Family: Titan. Launch Vehicle: Titan II. Gemini Titan malfunction detection system test plan. - . Nation: USA. Manned Spacecraft Center - Atlantic Missile Range Operations Office reported that the malfunction detection system would be flown on Titan II launches N-24, N-25, N-29, N-31, and N-32. The first launch in this so-called 'piggyback program' was scheduled for June 21. All preparations for this flight, including installation and checkout of all malfunction detection system components, were reported complete at a Titan II coordination meeting on June 14. 1963 June 20 - . Launch Site: Vandenberg. Launch Complex: Vandenberg 395-C. LV Family: Titan. Launch Vehicle: Titan II. Thread Needle - . Nation: USA. Agency: USAF AFSC. Apogee: 1,300 km (800 mi). Research and development launch. Mk 6 re-entry vehicle..
1963 June 25 - . LV Family: Titan. Launch Vehicle: Titan II. Martin-Baltimore received the stage II fuel tank for Gemini launch vehicle 2 from Martin-Denver. - . Nation: USA. This was a new tank, replacing a tank rejected for heat treatment cracks. Stage II oxidizer tank and stage I fuel and oxidizer tanks were received July 12 after a roll-out inspection at Martin-Denver July 1-3..
1963 June 30 - . Launch Site: Davis-Monthan AFB. LV Family: Titan. Launch Vehicle: Titan II. Davis-Monthan AFB - . The first Titan II flight at Davis-Monthan AFB was turned over to SAC's 570th Strategic Missile Squadron..
1963 July 12 - . LV Family: Titan. Launch Vehicle: Titan II. Effects on pilot performance of longitudinal oscillations (POGO) of the Gemini launch vehicle. - . Nation: USA. Gemini Project Office (GPO) completed a test program on the centrifuge at Ames Research Center to evaluate the effects on pilot performance of longitudinal oscillations (POGO) of the Gemini launch vehicle. When subjected to oscillatory g-loads ranging from 0 to � 3g superimposed on a steady-state load of 3.5g, pilot perception and performance decreased markedly above � 0.25g. Primary effects were impaired pilot vision, reduced eye scan rate, masked sensory perception and kinesthetic cues, and degraded speech. GPO reconfirmed the need to reduce POGO to a maximum of 0.25g. Backup for the first Gemini flight. - . Nation: USA. 1963 July 31 - . LV Family: Titan. Launch Vehicle: Titan II. 1963 August 21 - . 23:23 GMT - . Launch Site: Cape Canaveral. Launch Complex: Cape Canaveral LC15. LV Family: Titan. Launch Vehicle: Titan II. Research and development / Pod T-202 test / plume study mission - . Nation: USA. Agency: USAF AFSC. Apogee: 1,300 km (800 mi). Titan II development flight N-24 was launched from the Atlantic Missile Range. This was the first of five flight tests in the Gemini malfunction detection system (MDS) piggyback series. All MDS parameters were lost 81 seconds after liftoff because of a short circuit in the MDS. Operation in the second flight (N-25 on November 1) was normal except for two minor instrumentation problems. Three more test flights (N-29 on December 12, 1963; N-31 on January 15, 1964; and N-33 on March 23, 1964) verified the performance of the Gemini MDS under actual conditions of flight environment and engine operation. 1963 September 6 - . LV Family: Titan. Launch Vehicle: Titan II. Acceptance Test (CSAT) of Gemini launch vehicle No. 1 - . Nation: USA. Department of Defense approved the Titan II Augmented Engine Improvement Program. - . Nation: USA. On November 15, Aerojet-General received an Air Force contract to develop and test new engine components to correct weak and potentially dangerous problem areas of engine design. Aerojet-General had already initiated the development effort on September 30. The goal was to enhance engine reliability by a complete redesign rather than resort to piecemeal fixes as problems came up. While the primary goal was not achieved, the program did yield several side benefits, including the correction of several minor design deficiencies, the improvement of welding techniques, and the development of better assembly procedures. 1963 September 11-20 - . LV Family: Titan. Launch Vehicle: Titan II. 1963 September 14 - . LV Family: Titan. Launch Vehicle: Titan II. Gemini delay of three weeks in the battery qualification program. - . Nation: USA. Gemini Project Office reported a delay of about three weeks in the battery qualification program. McDonnell had sent a team to investigate the problem of high porosity welds in titanium battery cases. Another problem had turned up with the batteries in prequalification vibration test. The batteries vibrated excessively, although they did not fail electrically; the vibration's amplification factor was apparently low enough to be remedied by potting. 1963 September 30 - . LV Family: Titan. Launch Vehicle: Titan II. Gemini launch vehicle trainer. - . Nation: USA. Manned Spacecraft Center awarded its first incentive-type contract to Ling-Temco-Vought, Inc., Dallas, Texas for the fabrication of a trainer to be used in the Gemini launch vehicle training program. The fixed-price-incentive-fee contract had a target cost of $90,000, a target profit of $9,000, and a ceiling of $105,000. The incentive was based on cost only and provided for an 80/20 sharing arrangement; that is, the contractor would pay from his profit 20 percent of all savings under the target cost, or, alternatively, would receive 20 percent of all savings under the target cost. This meant that the contractor's profit would be zero after $97,500 was spent, and would be minus if costs exceeded $105,000. Backup for the injectors of the second stage engine of the Gemini launch vehicle. - . Nation: USA. Air Force Space Systems Division contracted with Aerojet-General for a program to develop a backup for the injectors of the second stage engine of the Gemini launch vehicle. Titan II development flights had shown the stage II engine tended toward incipient combustion instability. The Gemini Stability Improvement Program, begun as a backup, became a program aimed at maximum probability of success on December 24, 1963. The 18-month program produced a completely redesigned stage II engine injector. 1963 October 8 - . LV Family: Titan. Launch Vehicle: Titan II. 1963 October 25 - . LV Family: Titan. Launch Vehicle: Titan II. First Titan II Gemini Launch Vehicle. - . Spacecraft: Gemini. From the Martin Marietta Corporation, the Space Systems Division accepted the first Titan II Gemini Launch Vehicle..
1963 October 26 - . LV Family: Titan. Launch Vehicle: Titan II. Gemini launch vehicle 1 arrived at Atlantic Missile Range and was transferred to complex 19. - . Nation: USA. Stage I was erected in the complete vehicle erector October 28, stage II in the second stage erector October 29. The two stages were cabled together in the side-by-side configuration required for the Sequence Compatibility Firing scheduled for mid-December. A limited Electronic-Electrical Interference Test was completed November 7, and power was applied to the vehicle November 13. 1963 November 1 - . 20:15 GMT - . Launch Site: Cape Canaveral. Launch Complex: Cape Canaveral LC15. LV Family: Titan. Launch Vehicle: Titan II. Research and development / Pod T test / plume study mission - . Nation: USA. Agency: USAF AFSC. Apogee: 1,300 km (800 mi). Titan II development flight N-25 was launched from the Atlantic Missile Range. It carried the oxidizer surge chamber and fuel accumulator kit intended to reduce the amplitude of longitudinal vibration which had characterized earlier flights. NASA regarded 0.25g as the maximum level tolerable in manned space flight; this flight achieved a level of 0.22g, the first to fall within acceptable limits. Although the kit had been tested on only one flight, Gemini Project Office had sufficient confidence in it to decide, on November 6, to procure several more such kits for subsequent installation in Gemini launch vehicles. Two later Titan II development flights (N-29 on December 12, 1963, and N-31 on January 15, 1964) and the flight of Gemini-Titan 1 confirmed the validity of this decision. The required kits for the remaining Gemini launch vehicles were then procured. 1963 November 9 - . Launch Site: Vandenberg. Launch Complex: Vandenberg 395-C. LV Family: Titan. Launch Vehicle: Titan II. 1963 November 25 - . LV Family: Titan. Launch Vehicle: Titan II. First Titan II squadron to reach fully operational status. - . The 570th Strategic Missile Squadron became fully operational and was turned over to SAC..
1963 November 27 - . Launch Site: McConnell AFB. LV Family: Titan. Launch Vehicle: Titan II. McConnell AFB - . The 533d Strategic Missile Squadron, the first Titan II squadron at McConnell AFB, Kansas, was turned over to SAC..
1963 November 29 - . Launch Site: Davis-Monthan AFB. LV Family: Titan. Launch Vehicle: Titan II. All 18 Titan II launchers at Davis-Monthan AFB operational. - . All 18 Titan II launchers at Davis-Monthan AFB were operational with the turnover of the second squadron, the 571st Strategic Missile Squadron, to SAC's 390th Strategic Missile Wing..
1963 December 3 - . LV Family: Titan. Launch Vehicle: Titan II. Correction of Titan II deficiencies for the Gemini program. - . Nation: USA. The Gemini Program Planning Board issued a memorandum of understanding of the correction of the Titan II deficiencies for the Gemini program. This agreement formalized NASA specifications and Air Force plans to clean up problems related to longitudinal oscillations (POGO), combustion instability, and engine improvement. The program to alleviate the POGO effect included ground proof tests of all subsystems modified to control oscillations. Flight tests of the solutions would be flown on Titan II missiles before application to the Gemini launch vehicle. For the combustion stability program, dynamic stability would be demonstrated through the use of artificially produced disturbances, with the engines being flight tested on unmanned vehicles as final proof of man-rating. Engine improvement was a program to correct all design deficiencies that had cropped up during the Titan II development flights. 1963 December 4 - . Launch Site: McConnell AFB. LV Family: Titan. Launch Vehicle: Titan II. McConnell AFB - . The second McConnell Titan II squadron of LGM-25C missiles, the 532d Strategic Missile Squadron, was turned over to SAC..
1963 December 8 - . Launch Site: Little Rock AFB. LV Family: Titan. Launch Vehicle: Titan II. Little Rock AFB - . The first operational Titan II squadron at Little Rock AFB, the 373d Strategic Missile Squadron, was transferred to SAC..
1963 December 10 - . LV Family: Titan. Launch Vehicle: Titan II. 1963 December 12 - . 20:00 GMT - . Launch Site: Cape Canaveral. Launch Complex: Cape Canaveral LC15. LV Family: Titan. Launch Vehicle: Titan II. 1963 December 28 - . Launch Site: Little Rock AFB. LV Family: Titan. Launch Vehicle: Titan II. Final operational Titan II squadron transferred to SAC at Little Rock AFB. - . The sixth and final operational Titan II squadron, the 374th Strategic Missile Squadron, was transferred to SAC at Little Rock AFB, Arkansas. This action completed the programmed activation..
1963 December 31 - . LV Family: Titan. Launch Vehicle: Titan II. Gemini launch vehicle 1 completed the Combined Systems Test (CST). - . Nation: USA. 1964 January 15 - . Launch Site: Cape Canaveral. Launch Complex: Cape Canaveral LC15. LV Family: Titan. Launch Vehicle: Titan II. Research and development / Pod T test - . Nation: USA. Agency: USAF AFSC. Apogee: 1,300 km (800 mi). 1964 January 20 - . LV Family: Titan. Launch Vehicle: Titan II. Static test-to-failure of the Gemini spacecraft / launch vehicle interface - . Nation: USA. Martin-Baltimore conducted a static test-to-failure of the spacecraft/launch vehicle interface structure. Test results demonstrated a very satisfactory minimum structural margin of 23 percent above ultimate conditions expected to be met in the transonic buffet conditions of launch. Plans were made to hold a structures meeting in Houston on March 17-19, 1964, for final review of all load conditions, stress distribution, and margins, in readiness for the Gemini-Titan 1 mission. 1964 January 23 - . Launch Site: Vandenberg. Launch Complex: Vandenberg 395-C. LV Family: Titan. Launch Vehicle: Titan II. 1964 February 5 - . LV Family: Titan. Launch Vehicle: Titan II. Gemini launch vehicle 2 in test - . Nation: USA. Gemini launch vehicle 2 stage I and interstage were erected in the vertical test facility at Martin-Baltimore. Stage II was erected February 7. Subsystems Functional Verification Tests began February 21..
1964 February 21 - . LV Family: Titan. Launch Vehicle: Titan II. Gemini launch vehicle 1 Subsystem Functional Verification Tests (SSFVT) began on complex 19. - . Nation: USA. These repeated the SSFVT performed at Martin-Baltimore in the vertical test facility. Their purpose was to verify the vehicle's readiness to begin systems tests. SSFVT were completed on March 3..
1964 February 26 - . 20:15 GMT - . Launch Site: Cape Canaveral. Launch Complex: Cape Canaveral LC15. LV Family: Titan. Launch Vehicle: Titan II. 1964 March 5 - . LV Family: Titan. Launch Vehicle: Titan II. Gemini launch vehicle (GLV) 1 and spacecraft No. 1 were mechanically mated at complex 19. - . Nation: USA. Before GLV and spacecraft were electrically mated, the launch vehicle's status was reverified with a Combined Systems Test (CST) performed on March 10. A special series of Electronic-Electrical Interference (EEI) Tests began March 12 and ended March 25. Evaluation of test results confirmed that the intent of EEI testing had been accomplished, despite some persistent anomalies. A successful post-EEI systems reverification CST was performed March 27. 1964 March 13 - . Launch Site: Vandenberg. Launch Complex: Vandenberg 395-C. LV Family: Titan. Launch Vehicle: Titan II. Research and development test - . Nation: USA. Agency: USAF AFSC. Apogee: 1,300 km (800 mi). The 10th, and last, Titan II (XLGM-25C) research and development flight test missile (N-30) to be launched from Vandenberg completed a successful flight. .
1964 March 19 - . LV Family: Titan. Launch Vehicle: Titan II. Titan II development problems resolved. - . Nation: USA. Related Persons: Mueller. 1964 March 24 - . 01:42 GMT - . Launch Site: Cape Canaveral. Launch Complex: Cape Canaveral LC15. LV Family: Titan. Launch Vehicle: Titan II. Research and development / Pod T-207 - . Nation: USA. Agency: USAF AFSC. Apogee: 1,300 km (800 mi). 1964 March 31 - . LV Family: Titan. Launch Vehicle: Titan II. Gemini launch vehicle (GLV) 1 modifications completed. - . Nation: USA. Electrical and mechanical modification of Gemini launch vehicle (GLV) 1 airborne components was completed. GLV-1 had been shipped to the Cape equipped with several items to be used only for ground tests. These were replaced with flight units, beginning January 31. The GLV-1 Wet Mock Simulated Launch, a complete countdown exercise including propellant loading, was successfully completed April 2. Testing concluded on April 5 with a Simulated Flight Test. 1964 April 9 - . 20:00 GMT - . Launch Site: Cape Canaveral. Launch Complex: Cape Canaveral LC15. LV Family: Titan. Launch Vehicle: Titan II. Research and development / Pod RVIP test / plume study mission - . Nation: USA. Agency: USAF AFSC. Apogee: 1,300 km (800 mi). The 23d, and last, Titan II research and development missile (N-3A) to be launched down the Atlantic range completed a success ful flight. With the 10 test flights from Vandenberg, a total of 33 Titan II (XLGM-25C) R&D flights had been completed since 16 March 1962 - 27 successes and only six failures. This Air Force conducted test program contributed significantly to the development of the Gemini launch vehicle; the Gemini malfunction detection system was tested on five flights, Gemini guidance components on three, and the longitudinal oscillation fix on four. In addition to flight testing these (and other) critical components, these flights also enhanced confidence in the use of the Titan II as a launch vehicle. Thirty-two Titan II test flights were analyzed to determine whether any characteristic of the flight would have demanded a Gemini abort; 22 were adjudged successful from the standpoint of a Gemini mission, nine would have required Gemini to abort, and one resulted in a prelaunch shutdown. 1964 April 14 - . LV Family: Titan. Launch Vehicle: Titan II. Electrical-Electronic Interference Tests on Gemini launch vehicle (GLV) 2 - . Nation: USA. Electrical-Electronic Interference Tests began on Gemini launch vehicle (GLV) 2 in the vertical test facility at Martin-Baltimore. Oscillograph recorders monitored 20 GLV and aerospace ground equipment (AGE) circuits, five of which displayed anomalies. Two hydraulic switchover cicuits showed voltage transients exceeding failure criteria, but a special test fixed this anomaly in the AGE rather than the GLV. 1964 April 22 - . LV Family: Titan. Launch Vehicle: Titan II. 1964 April 27 - . LV Family: Titan. Launch Vehicle: Titan II. 1964 May 8 - . LV Family: Titan. Launch Vehicle: Titan II. Gemini launch vehicle model static and dynamic loads test. - . Nation: USA. Langley Research Center completed tests on a model of the Gemini launch vehicle to determine the static and dynamic loads imposed on the vehicle and the launch vehicle erector by ground winds. Simulated wind velocities of 5 to 52 miles per hour did not produce loads great enough to be of concern. Tests had begun on April 15. 1964 June 10 - . LV Family: Titan. Launch Vehicle: Titan II. Contract with Martin for 15 Gemini launch vehicles (GLV) converted. - . Nation: USA. Air Force Space Systems Division's cost-plus-fixed-fee contract with Martin for 15 Gemini launch vehicles (GLV) and associated aerospace ground equipment was replaced by a cost-plus-incentive-fee contract. Contract negotiations had been conducted between March 15 and April 30, 1964. The final contract contained cost, performance, and schedule incentives. Target cost was $111 million and target fee was $8.88 million. The maximum fee possible under the contract was $16.65 million as against a minimum of $3.33 million. The period of performance under the contract was July 1, 1963, through December 31, 1967, and covered the delivery of 14 GLVs (one GLV had already been delivered) and associated equipment and services, including checkout and launch. 1964 June 12 - . LV Family: Titan. Launch Vehicle: Titan II. Three basic plans were under study for Gemini rendezvous missions. - . Nation: USA. Flight: Gemini 6. Spacecraft: Gemini. Christopher C. Kraft, Jr., Assistant Director for Flight Operations, Manned Spacecraft Center, reported that three basic plans were under study for rendezvous missions. Rendezvous at first apogee would probably be rejected because of possible dispersions which might necessitate plane changes. Rendezvous from concentric orbits seemed to be desirable because of the freedom in selection of the geographic position of rendezvous. Major work thus far, however, had been expended on the tangential rendezvous. Subsequently, the concentric orbit plan was chosen for Gemini-Titan 6, the first rendezvous mission. 1964 June 17 - . LV Family: Titan. Launch Vehicle: Titan II. Contract with Aerojet-General for engines and related aerospace ground equipment revised. - . Nation: USA. Air Force Space Systems Division's cost-plus-fixed-fee contract with Aerojet-General for engines and related aerospace ground equipment for the Gemini launch vehicle was replaced by a cost-plus-incentive-fee contract. Contract negotiations had been conducted between May 25 and June 17, 1964. The final contract covered the procurement of 14 sets of engines (one set had already been delivered) and associated equipment during the period from July 1, 1963, through December 31, 1967. Cost, performance, and schedule incentives made possible a maximum fee of $5,885,250 versus a minimum fee of $1,177,050. The initial target cost was $39,235,000 with a target fee of $3,138,800. 1964 July 3 - . LV Family: Titan. Launch Vehicle: Titan II. Gemini spacecraft 2 began the second phase of Spacecraft Systems Tests. - . Nation: USA. 1964 July 11 - . LV Family: Titan. Launch Vehicle: Titan II. Gemini launch vehicle 2 arrived at Eastern Test Range. - . Nation: USA. Stage I was erected at complex 19 on July 13, stage II on July 14. Electrical power was applied to the vehicle on July 20 in preparation for Subsystems Functional Verification Tests, which began July 21..
1964 July 30 - . LV Family: Titan. Launch Vehicle: Titan II. Gemini missions beyond the 12 originally planned considered. - . Nation: USA. In response to a request from NASA Headquarters, Gemini Program Office (GPO) provided a study for Gemini missions beyond the 12 originally planned. 'The Advanced Gemini Missions Conceptual Study' described 16 further missions, including a space station experiment, a satellite chaser mission, a lifeboat rescue mission, and both a circumlunar and lunar orbiting mission. On February 28, 1965, GPO reported that a preliminary proposal for Gemini follow-on missions to test the land landing system had not been approved. 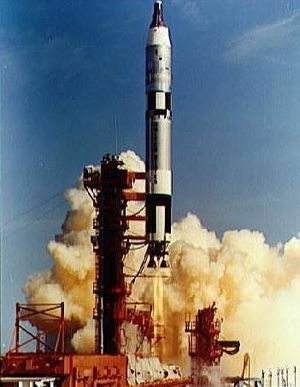 Spare Gemini launch vehicles 13, 14, and 15 were canceled, and there were no current plans for Gemini missions beyond the approved 12-flight program. 1964 August 11 - . Launch Site: Vandenberg. Launch Complex: Vandenberg 395-C. LV Family: Titan. Launch Vehicle: Titan II. Double Talley - . Nation: USA. Agency: USAF SAC. Apogee: 1,300 km (800 mi). Demonstration and shakedown operations launch. 1964 August 16 - . LV Family: Titan. Launch Vehicle: Titan II. Gemini launch vehicle 6 in assembly - . Nation: USA. Flight: Gemini 6. Spacecraft: Gemini. Martin-Baltimore received the propellant tanks for Gemini launch vehicle 6 from Martin-Denver, which had begun fabricating them in April. After being inspected, the tanks were placed in storage where they remained until December 18..
1964 August 17 - . LV Family: Titan. Launch Vehicle: Titan II. 1964 August 27 - . LV Family: Titan. Launch Vehicle: Titan II. Hurricane Cleo struck the Cape Kennedy area. - . Nation: USA. Stage II of Gemini launch vehicle (GLV) 2 was deerected and stored; the erector was lowered to horizontal, and stage I was lashed in its vertical position. Stage II was reerected September 1. Power was applied to the launch vehicle September 2, and Subsystem Functional Verification Tests (SSFVT) began September 3. When forecasts indicated that Hurricane Dora would strike Cape Kennedy, both stages of GLV-2 were deerected on September 8 and secured in the Missile Assembly Building. Hurricane Ethel subsequently threatened the area, and both stages remained in the hanger until September 14, when they were returned to complex 19 and reerected. SSFVT, begun again on September 18, ended successfully October 5. 1964 September 4 - . LV Family: Titan. Launch Vehicle: Titan II. Gemini launch vehicle (GLV) 2 to be flown as scheduled - . Nation: USA. Air Force Space Systems Division (SSD), supported by launch vehicle contractors, recommended that Gemini launch vehicle (GLV) 2 be flown as scheduled. Manned Spacecraft Center had proposed dropping GLV-2 from the Gemini program because of possible ill effects resulting from the electromagnetic incident of August 17 and from Hurricane Cleo. GLV-3 would then be substituted for the second Gemini mission, and the program would be shortened by one flight. After reviewing the incidents, their effects, corrective action, and retesting, SSD, Martin, Aerospace, and Aerojet-General all felt GLV-2 should fly, and NASA accepted their recommendation. 1964 September 21 - . LV Family: Titan. Launch Vehicle: Titan II. Spacecraft No. 2 arrived at Cape Kennedy - . Nation: USA. Spacecraft Bus: Gemini. 1964 September 30 - . LV Family: Titan. Launch Vehicle: Titan II. Engineering responsibility for Titan II transferred - . Engineering responsibility for the Titan II weapon system (WS 107C) program was transferred from Ballistic Systems Division to AFLC's San Bernardino Air Materiel Area (SBAMA) at Norton AFB, California. 1964 October 2 - . Launch Site: Vandenberg. Launch Complex: Vandenberg 395-C. LV Family: Titan. Launch Vehicle: Titan II. Black Widow - . Nation: USA. Agency: USAF SAC. Apogee: 1,300 km (800 mi). Demonstration and shakedown operations launch. 1964 October 6 - . LV Family: Titan. Launch Vehicle: Titan II. Combined Systems Test (CST) of Gemini launch vehicle 2 - . Nation: USA. The Prespacecraft Mate Combined Systems Test (CST) of Gemini launch vehicle 2 was completed at complex 19. This test, similar to CST performed at the Martin plant, comprised an abbreviated countdown and simulation of flight events, with a simulator representing electrical characteristics of the spacecraft; its purpose was to establish confidence in the launch vehicle. Electrical Electronic Interference Tests were completed October 12. Hurricane Isbell threatened the area on October 14-15, but its path was far enough south of the Cape to make deerection unnecessary, though testing was curtailed. Launch Vehicle for the first manned Gemini spaceflight mission turned over to the Air Force, - . Spacecraft: Gemini. The Titan II Gemini Launch Vehicle (GLV-3) for the first manned Gemini spaceflight mission (GT-3) was turned over to the Air Force at Martin Marietta's Baltimore, Maryland, plant..
1964 November 17 - . LV Family: Titan. Launch Vehicle: Titan II. 1964 December 9 - . LV Family: Titan. Launch Vehicle: Titan II. Gemini-Titan (GT) 2 launch attempt. - . Nation: USA. Gemini-Titan (GT) 2 launch countdown began at 4:00 a.m., e.s.t., and proceeded normally, with minor holds, until about one second after engine ignition. At that point a shutdown signal from the master operations control set (MOCS) terminated the launch attempt. Loss of hydraulic pressure in the primary guidance and control system of stage I of the launch vehicle caused an automatic switchover to the secondary guidance and control system. During the 3.2-second holddown following ignition command, switchover was instrumented as a shutdown command. Accordingly, the MOCS killed the launch attempt. Subsequent investigation disclosed that loss of hydraulic pressure had been caused by failure of the primary servo-valve in one of the four tandem actuators which control movement of the stage I thrust chambers. All four stage I tandem actuators were replaced with redesigned actuators. Mission Control Center at Houston used passively in the Gemini-Titan 2 launch attempt. - . Nation: USA. The Mission Control Center at Houston was used passively and in parallel with the Mission Control Center at the Cape in the Gemini-Titan 2 launch attempt, primarily to validate the computer launch programs. In addition, considerable use was made of the telemetry processing program and related television display formats. The Houston control center received, processed, and displayed live and simulated Gemini launch vehicle and spacecraft data. Test results were considered very successful. 1964 December 18 - . LV Family: Titan. Launch Vehicle: Titan II. Martin-Baltimore removed the propellant tanks for Gemini launch vehicle (GLV) 6 from storage. - . Nation: USA. Flight: Gemini 6. Spacecraft: Gemini. Cleaning the tanks and purging them with nitrogen was completed February 5, 1965. Aerojet-General delivered the flight engines for GLV-6 February 1. Tank splicing was completed February 23, engine installation, February 25. GLV-6 horizontal testing was completed April 3. 1965 January 1 - . LV Family: Titan. Launch Vehicle: Titan II. Acquisition phase of the Titan II program completed. - . The acquisition phase of the Titan II program was completed, and the Ballistic Systems Division Titan System Program Office was discontinued as of 31 December 1964..
1965 January 6 - . LV Family: Titan. Launch Vehicle: Titan II. Redesigned stage I tandem actuators were received and installed in Gemini launch vehicle (GLV) 2. - . Nation: USA. Although some retesting began shortly after the Gemini-Titan 2 mission was scrubbed on December 9, 1964, most activity in preparing GLV-2 for another launch attempt was curtailed until the new actuators arrived. Subsystems retesting then began. The final combined systems test - the Simulated Flight Test - was completed January 14, with launch scheduled for January 19. Titan II Facilities Update. - . A $9.5 million contract was awarded to Peter Kiewit Sons Company for Project Yard Fence, Titan II Facilities Update. The project was to utilize improved technology of minimize maintenance activities and to improve Titan II support equipment of the squadrons at Davis-Monthan, Little Rock, McConnell, and Vandenberg. 1965 January 14 - . LV Family: Titan. Launch Vehicle: Titan II. Interval between Gemini flights reduced from three to two months. - . Nation: USA. Flight: Gemini 6. Spacecraft: Gemini. 1965 January 19 - . LV Family: Titan. Launch Vehicle: Titan II. Built-in holds in the GLV/Gemini countdown. - . Nation: USA. Spacecraft Bus: Mercury & Gemini Spacecraft Systems Development Diaries. Spacecraft: Gemini Fuel Cell. The study of 325 missile countdowns, 205 missile launches, as well as all Titan scrubs and holds, indicated that GLV launching would be considerably improved and a great many scrubs precluded by the addition of such holds..
1965 January 20 - . LV Family: Titan. Launch Vehicle: Titan II. Gemini 1 - . Nation: Russia. Kamanin observes that Gemini 1 was sent with mannequins on a suborbital trajectory, splashing down 3400 km from Cape Canaveral after 20 minutes of flight. He cannot believe this trajectory was intentional; the Soviets only fly mannequins aboard flights with the same duration as the planned manned mission. Kamanin believes this represents the third failure of the Titan 2 booster. Meanwhile, Soviet capability in centrifuges, is improving, albeit slowly. A centrifuge with a 16-m arm is to be completed by 1970, and one of 7 M in 1966. 1965 February 25 - . LV Family: Titan. Launch Vehicle: Titan II. Martin-Denver delivered propellant tanks for Gemini launch vehicle (GLV) 7 to Martin-Baltimore. - . Nation: USA. Flight: Gemini 7. Spacecraft: Gemini. Tank fabrication had begun in May 1964. Martin-Baltimore recleaned and purged the tanks with nitrogen by April 20, 1965. In the meantime, flight engines for GLV-7 arrived from Aerojet-General on April 17. Tank splicing was completed May 6 and engine installation May 20. All horizontal testing was completed June 14. A modification period followed. 1965 April 14-15 - . LV Family: Titan. Launch Vehicle: Titan II. 1965 April 15 - . LV Family: Titan. Launch Vehicle: Titan II. Martin-Denver delivered the propellant tanks for Gemini launch vehicle 8 to Martin-Baltimore. - . Nation: USA. Flight: Gemini 8. Spacecraft: Gemini. Tank fabrication had begun September 25, 1964. Aerojet-General delivered the stage I engine on June 16 and the stage II on August 20. In the meantime, tank splicing was completed August 3. Engine installation was completed September 23, and all hoizontal testing ended September 27. 1965 April 16 - . 19:19 GMT - . Launch Site: Vandenberg. Launch Complex: Vandenberg 395-C. LV Family: Titan. Launch Vehicle: Titan II. Bear Hug operational test - . Nation: USA. Agency: USAF SAC. Apogee: 1,300 km (800 mi). 1965 June 14 - . 13:31 GMT - . Launch Site: Vandenberg. Launch Complex: Vandenberg 395-C. LV Family: Titan. Launch Vehicle: Titan II. Gold Fish operational test - . Nation: USA. Agency: USAF SAC. Apogee: 1,300 km (800 mi). Gemini launch vehicle (GLV) 7 in test - . Nation: USA. Flight: Gemini 7. Spacecraft: Gemini. 1965 August 9 - . Launch Site: Little Rock AFB. Launch Complex: Little Rock AFB. LV Family: Titan. Launch Vehicle: Titan II. Accident at Titan 2 Silo 373-4, Little Rock AFB, kills 53. - . Nation: USA. A fire started in the silo during construction work. Two workers survived. The Titan 2 missile was fueled and in the silo but did not explode. The warhead had been removed from the site prior to the start of construction. The complex wass off alert status for the next 13 months during the accident investigation and repairs. 1965 August 16 - . 20:04 GMT - . Launch Site: Vandenberg. Launch Complex: Vandenberg 395-C. LV Family: Titan. Launch Vehicle: Titan II. Magic Lamp operational test - . Nation: USA. Agency: USAF SAC. Apogee: 1,300 km (800 mi). 1965 August 30 - . LV Family: Titan. Launch Vehicle: Titan II. Stage I of Gemini launch vehicle (GLV) 6 was erected at complex 19. - . Nation: USA. Flight: Gemini 6. Spacecraft: Gemini. Stage II was erected the following day. Umbilicals were connected and inspected September 1, and Subsystems Reverification Tests began September 2. These tests were completed September 15. The Prespacecraft Mate Verification Test of GLV-6 was run September 16. 1965 September 16 - . LV Family: Titan. Launch Vehicle: Titan II. Gemini launch vehicle (GLV) 10 in assembly - . Nation: USA. Flight: Gemini 10, Gemini 11. Spacecraft: Gemini. During the rail trip, leaking battery acid corroded the dome of the stage II fuel tank. The tanks arrived at Martin-Baltimore September 21. The stage II fuel tank was rejected and returned to Denver. It was replaced by the stage II fuel tank from GLV-11, which completed final assembly September 25 and arrived in Baltimore November 3 after being inspected and certified. Fabrication of GLV-10 tanks had begun in April. 1965 September 17 - . LV Family: Titan. Launch Vehicle: Titan II. Gemini launch vehicle (GLV) 6 and spacecraft No. 6 were mechanically mated at complex 19. - . Nation: USA. Flight: Gemini 6. Spacecraft: Gemini. The Electrical Interface Integrated Validation and Joint Guidance and Control Test was completed September 21. The spacecraft/GLV Joint Combined Systems Test was run September 23. GLV tanking test was performed September 29 and the Flight Configuration Mode Test October 1, completing systems testing for Gemini-Titan 6. 1965 September 20 - . LV Family: Titan. Launch Vehicle: Titan II. Acceptance Test of Gemini launch vehicle (GLV) 7 - . Nation: USA. Flight: Gemini 7. Spacecraft: Gemini. 1965 September 28 - . LV Family: Titan. Launch Vehicle: Titan II. Gemini launch vehicle (GLV) 8 in test - . Nation: USA. Flight: Gemini 8. Spacecraft: Gemini. 1965 October 20 - . 18:09 GMT - . Launch Site: Vandenberg. Launch Complex: Vandenberg 395-C. LV Family: Titan. Launch Vehicle: Titan II. Power Box - . Nation: USA. Agency: USAF SAC. Apogee: 1,300 km (800 mi). Operational missile test. Some lists give launch date as 10 October..
1965 October 28 - . LV Family: Titan. Launch Vehicle: Titan II. Gemini 6 spacecraft and launch vehicle put in storage - . Nation: USA. Flight: Gemini 6. Spacecraft: Gemini. 1965 October 29-30 - . LV Family: Titan. Launch Vehicle: Titan II. Gemini launch vehicle (GLV) 7 was erected at complex 19, following the deerection of GLV-6. - . Nation: USA. Flight: Gemini 7. Spacecraft: Gemini. Power was applied to GLV-7 on October 31, and Subsystems Reverification Tests (SSRT) began immediately. SSRT ended November 9, and the Prespacecraft Mate Verification Test was performed November 10. This test now included dropping all umbilicals, eliminating the need for a Flight Configuration Mode Test (FCMT). No FCMT was performed on GLV-7 or any subsequent vehicle. 1965 November 3 - . LV Family: Titan. Launch Vehicle: Titan II. Gemini launch vehicle (GLV) 11 in assembly - . Nation: USA. Flight: Gemini 10, Gemini 11. Spacecraft: Gemini. 1965 November 8 - . LV Family: Titan. Launch Vehicle: Titan II. Acceptance Test of Gemini launch vehicle (GLV) 8 - . Nation: USA. Flight: Gemini 8. Spacecraft: Gemini. 1965 November 19 - . LV Family: Titan. Launch Vehicle: Titan II. The stage I engine had been delivered August 23. Martin-Baltimore completed splicing stage I January 12, 1966; stage II splicing, using the fuel tank reassigned from GLV-11, was finished February 2. Engine installation was completed February 7, and stage I horizontal tests February 11. Stage II horizontal testing ended March 2. 1965 December 4 - . LV Family: Titan. Launch Vehicle: Titan II. Gemini launch vehicle (GLV) 6 at complex 19 two hours after launch of Gemini VII. - . Nation: USA. Flight: Gemini 6, Gemini 7. Spacecraft Bus: Gemini space suits. Spacecraft: G5C, Gemini. 1965 December 12 - . LV Family: Titan. Launch Vehicle: Titan II. Gemini 6 launch aborted. - . Nation: USA. Flight: Gemini 6, Gemini 7. Spacecraft: Gemini. The Titan 2 engines shut down a moment after ignition. The fault that caused the Titan to shut down saved the astronaut's lives; the quick thinking of the astronauts in not pulling the abort handles saved the mission. The scheduled launch of Gemini VI-A was aborted when the Master Operations Control Set automatically shut down the Gemini launch vehicle a second after engine ignition because an electrical umbilical connector separated prematurely. The launch was canceled at 9:54 a.m., e.s.t. Emergency procedures delayed raising the erector until 11:28, so the crew was not removed until 11:33 a.m. Launch was rescheduled for December 15. Routine analysis of the engine data, begun immediately after shutdown, revealed decaying thrust in one first stage engine subassembly before shutdown had been commanded. The problem was diagnosed as a restriction in the gas generator circuit of the subassembly, which would have caused shutdown about 1 second later than it actually occurred as a result of the umbilical disconnect. Source of the restriction proved to be a protective dust cap inadvertently left in place in the gas generator oxidizer injector inlet port. The anomalies were corrected and recycling, based on long-prepared contingency plans, proceeded without incident through launch on December 15. 1965 December 22 - . 14:10 GMT - . Launch Site: Vandenberg. Launch Complex: Vandenberg 395-C. LV Family: Titan. Launch Vehicle: Titan II. Sea Rover operational test - . Nation: USA. Agency: USAF SAC. Apogee: 1,300 km (800 mi). 1966 January 13 - . LV Family: Titan. Launch Vehicle: Titan II. 1966 January 20 - . LV Family: Titan. Launch Vehicle: Titan II. Gemini launch vehicle (GLV) 12 in assembly - . Nation: USA. Flight: Gemini 11, Gemini 12. Spacecraft: Gemini. 1966 February 10 - . LV Family: Titan. Launch Vehicle: Titan II. Gemini launch vehicle 8 and spacecraft 8 were electrically mated. - . Nation: USA. Flight: Gemini 8. Spacecraft: Gemini. The Electrical Interface Integrated Validation and Joint Guidance and Control Test was completed February 14. After data from this test were reviewed (February 15), the Joint Combined Systems Test was run February 16..
1966 February 17 - . LV Family: Titan. Launch Vehicle: Titan II. The tanking test of Gemini launch vehicle (GLV) 8 was conducted. - . Nation: USA. Flight: Gemini 8. Spacecraft: Gemini. While the launch vehicle was being cleaned up after the test, spacecraft No. 8 Final Systems Test was completed February 23. On February 25, GLV and spacecraft were temporarily mated for an erector-cycling test. The extravehicular support package and life support system were checked out and installed in the spacecraft between February 26 and March 5, while GLV systems were modified and revalidated February 28 to March 3. 1966 February 28 - . LV Family: Titan. Launch Vehicle: Titan II. Gemini launch vehicle 10 tests - . Nation: USA. Flight: Gemini 10. Spacecraft: Gemini. Stage I of Gemini launch vehicle 10 was erected in the east cell of the vertical test facility at Martin-Baltimore. After completing horizontal testing March 3, stage II was erected March 7. Power was applied to the vehicle for the first time on March 14. Subsystems Functional Verification Tests were completed April 13. 1966 March 25 - . 09:42 GMT - . Launch Site: Vandenberg. Launch Complex: Vandenberg 395-C. LV Family: Titan. Launch Vehicle: Titan II. Close Touch operational test - . Nation: USA. Agency: USAF SAC. Apogee: 1,300 km (800 mi). 1966 April 14 - . LV Family: Titan. Launch Vehicle: Titan II. Acceptance Test (CSAT) of Gemini launch vehicle (GLV) 10 - . Nation: USA. Flight: Gemini 10. Spacecraft: Gemini. The Combined Systems Acceptance Test (CSAT) of Gemini launch vehicle (GLV) 10 was conducted at Martin-Baltimore. The CSAT was followed by a performance data review, completed April 19. The vehicle acceptance team convened April 26 and accepted GLV-10 on April 29. The vehicle was deerected May 2-4 and formally accepted by the Air Force May 18. Stage I was flown to Cape Kennedy the same day, with stage II following May 20. Both stages were transferred to Hanger L where they were purged and pressurized with dry nitrogen and placed in controlled access storage. 1966 April 18 - . LV Family: Titan. Launch Vehicle: Titan II. Gemini launch vehicle 11 tests - . Nation: USA. Flight: Gemini 11. Spacecraft: Gemini. Stage I of Gemini launch vehicle 11 was erected in the west cell of the vertical test facility at Martin-Baltimore. After completing horizontal tests April 25, stage II was erected April 29. Power was applied to the vehicle for the first time on May 9, and Subsystems Functional Verification Tests were completed June 8. 1966 April 20 - . LV Family: Titan. Launch Vehicle: Titan II. The tanking test of Gemini launch vehicle (GLV) 9 was conducted. - . Nation: USA. Flight: Gemini 11. Spacecraft: Gemini. 1966 May 24 - . Launch Site: Vandenberg. Launch Complex: Vandenberg 395-C. LV Family: Titan. Launch Vehicle: Titan II. Silver Bullett Follow-On Operational Test - . Nation: USA. Agency: USAF SAC. Apogee: 1,300 km (800 mi). The first Titan II Follow-On Operational Test (FOT) missile to be launched from Vandenberg was a failure..
1966 June 7 - . LV Family: Titan. Launch Vehicle: Titan II. Gemini launch vehicle 10 was removed from storage and erected at complex 19. - . Nation: USA. Flight: Gemini 10. Spacecraft: Gemini. Umbilicals were connected and power applied June 9. Subsystems Reverification Tests (SSRT) began immediately. SSRT ended June 16, and the Prespacecraft Mate Verification Combined Systems Test was conducted June 17..
1966 June 9 - . LV Family: Titan. Launch Vehicle: Titan II. The launch vehicle acceptance test of Gemini launch vehicle (GLV) 11 was conducted. - . Nation: USA. Flight: Gemini 10. Spacecraft: Gemini. The vehicle acceptance team convened June 20 and accepted GLV-11 June 24. The vehicle was deerected June 29 and formally accepted by the Air Force on July 11. Stage I was delivered by air to Cape Kennedy the same day and stage II on July 13. Both stages were transferred to Hanger U where the tanks were purged and pressurized. The stages remained in controlled access storage until the launch pad was revalidated after the launch of Gemini X; revalidation was completed July 21. 1966 June 20 - . LV Family: Titan. Launch Vehicle: Titan II. Gemini launch vehicle 10 and spacecraft No. 10 were electrically mated at complex 19. - . Nation: USA. Flight: Gemini 10. Spacecraft: Gemini. The Electrical Interface Integrated Validation and Joint Guidance and Control Test was conducted June 20-21. Following a data review, the Joint Combined Systems Test was run June 23..
1966 June 24 - . LV Family: Titan. Launch Vehicle: Titan II. The tanking test of Gemini launch vehicle (GLV) 10 was conducted. - . Nation: USA. Flight: Gemini 10. Spacecraft: Gemini. 1966 July 22 - . LV Family: Titan. Launch Vehicle: Titan II. Gemini launch vehicle 11 was removed from storage and erected at complex 19. - . Nation: USA. Flight: Gemini 11. Spacecraft: Gemini. After the vehicle was inspected and umbilicals connected, power was applied July 27, and Subsystems Reverification Tests (SSRT) began. SSRT ended August 4, and the Prespacecraft Mate Verification Combined Systems Test was run the following day..
1966 July 29 - . LV Family: Titan. Launch Vehicle: Titan II. The launch vehicle acceptance test of Gemini launch vehicle (GLV) 12 was conducted. - . Nation: USA. Flight: Gemini 12. Spacecraft: Gemini. The vehicle acceptance team convened August 9 and accepted the vehicle August 12. GLV-12 was deerected August 17 and formally accepted by the Air Force August 30. Stage I was airlifted to Cape Kennedy the same day. Stage II arrived September 3. Both stages were placed in controlled access storage in Hanger T pending the launch of Gemini XI and the revalidation of the launch pad, completed September 16. 1966 August 8 - . LV Family: Titan. Launch Vehicle: Titan II. Gemini launch vehicle 11 and spacecraft No. 11 were electrically mated at complex 19. - . Nation: USA. Flight: Gemini 11. Spacecraft: Gemini. Elecrical Interface Integrated Validation and Joint Guidance and Control Test was conducted August 8-9. The Joint Combined Systems Test followed August 11-12..
1966 August 15 - . LV Family: Titan. Launch Vehicle: Titan II. The tanking test of Gemini launch vehicle (GLV) 11 was conducted. - . Nation: USA. Flight: Gemini 11. Spacecraft: Gemini. While GLV post-tanking operations were being performed, the Final Systems Tests of spacecraft No. 11 were conducted August 22-23. Spacecraft and GLV were mechanically mated August 24 and erector cycling was tested. The electrical interface was revalidated August 25-29. The Simultaneous Launch Demonstration on August 31 and the Simulated Flight Test on September 1 completed prelaunch testing. 1966 September 16 - . Launch Site: Vandenberg. Launch Complex: Vandenberg 395-C. LV Family: Titan. Launch Vehicle: Titan II. Black River Follow-On Operational Test - . Nation: USA. Agency: USAF SAC. Apogee: 1,300 km (800 mi). 1966 September 19 - . LV Family: Titan. Launch Vehicle: Titan II. Gemini launch vehicle (GLV) 12 was removed from storage and erected at complex 19. - . Nation: USA. Flight: Gemini 12. Spacecraft: Gemini. Umbilicals were connected after GLV inspection September 21. Power was applied the next day and Subsystems Reverification Tests (SSRT) began September 23. SSRT ended October 2 and Prespacecraft Mate Verification Combined Systems Test was run October 4..
1966 October 5 - . LV Family: Titan. Launch Vehicle: Titan II. Gemini launch vehicle 12 and spacecraft No. 12 were electrically mated at complex 19. - . Nation: USA. Flight: Gemini 12. Spacecraft: Gemini. The Electrical Interface Integrated Validation and Joint Guidance and Control Test was conducted October 5-6, and data was reviewed the following day. The Joint Combined Systems Test was run on October 10..
1966 October 11 - . LV Family: Titan. Launch Vehicle: Titan II. The tanking test of Gemini launch vehicle (GLV) 12 was conducted. - . Nation: USA. Flight: Gemini 12. Spacecraft: Gemini. While the GLV was being cleaned up after the tanking test, the Final Systems Test of spacecraft No. 12 was conducted October 17-19. Spacecraft and GLV were mechanically mated October 25 and the erector was cycled. The spacecraft guidance system was retested October 26-27, and the spacecraft/GLV electrical interface was revalidated October 28. The Simultaneous Launch Demonstration on November 1 and the Simulated Flight Test on November 2 completed prelaunch testing and checkout. 1967 January 15 - . Launch Site: Little Rock AFB. LV Family: Titan. Launch Vehicle: Titan II. Project Yard Fence completed - . Project Yard Fence, the updating of Titan II sites, was completed at Little Rock AFB, Arkansas..
1967 March 17 - . Launch Site: Vandenberg. Launch Complex: Vandenberg 395-C. LV Family: Titan. Launch Vehicle: Titan II. Gift Horse Follow-On Operational Test - . Nation: USA. Agency: USAF SAC. Apogee: 1,300 km (800 mi). 1967 October 30 - . Launch Site: Davis-Monthan AFB. LV Family: Titan. Launch Vehicle: Titan II. Updated Titan II ICBM sites under Project Yard Fence. - . The last of 18 updated Titan II ICBM sites was returned to the 390th Strategic Missile Wing at Davis-Monthan AFB, Arizona. The work was completed as part of the Project Yard Fence update program..
1968 April 2 - . Launch Site: Vandenberg. Launch Complex: Vandenberg 395-C. LV Family: Titan. Launch Vehicle: Titan II. Glory Trip 10T Follow-On Operational Test - . Nation: USA. Agency: USAF SAC. Apogee: 1,300 km (800 mi). 1968 June 12 - . Launch Site: Vandenberg. Launch Complex: Vandenberg 395-C. LV Family: Titan. Launch Vehicle: Titan II. Glory Trip 08T Follow-On Operational Test - . Nation: USA. Agency: USAF SAC. Apogee: 1,300 km (800 mi). 1968 August 21 - . Launch Site: Vandenberg. Launch Complex: Vandenberg 395-C. LV Family: Titan. Launch Vehicle: Titan II. Glory Trip 18T Follow-On Operational Test - . Nation: USA. Agency: USAF SAC. Apogee: 1,300 km (800 mi). 1968 November 19 - . Launch Site: Vandenberg. Launch Complex: Vandenberg 395-C. LV Family: Titan. Launch Vehicle: Titan II. Glory Trip 26T Follow-On Operational Test - . Nation: USA. Agency: USAF SAC. Apogee: 1,300 km (800 mi). 1971 June 20 - . 22:45 GMT - . Launch Site: Vandenberg. Launch Complex: Vandenberg 395-C. LV Family: Titan. Launch Vehicle: Titan II. SSTTP M1-17 Target mission - . Nation: USA. Agency: USAF SAC. Apogee: 1,300 km (800 mi). Safeguard System Test Target..
1971 August 28 - . 02:22 GMT - . Launch Site: Vandenberg. Launch Complex: Vandenberg 395-C. LV Family: Titan. Launch Vehicle: Titan II. SSTTP M2-1 test - . Nation: USA. Agency: USAF SAC. Apogee: 1,300 km (800 mi). Safeguard System Test Target..
1972 May 24 - . 23:45 GMT - . Launch Site: Vandenberg. Launch Complex: Vandenberg 395-C. LV Family: Titan. Launch Vehicle: Titan II. SSTTP M2-10 Target mission - . Nation: USA. Agency: USAF SAC. Apogee: 1,300 km (800 mi). Safeguard System Test Target..
1972 October 11 - . 11:30 GMT - . Launch Site: Vandenberg. Launch Complex: Vandenberg 395-C. LV Family: Titan. Launch Vehicle: Titan II. SSTTP M2-14 Target mission - . Nation: USA. Agency: USAF SAC. Apogee: 1,300 km (800 mi). Safeguard System Test Target..
1973 October 6 - . Launch Site: Vandenberg. Launch Complex: Vandenberg 395-C. LV Family: Titan. Launch Vehicle: Titan II. SSTTP M2-27 Target mission - . Nation: USA. Agency: USAF SAC. Apogee: 1,300 km (800 mi). Safeguard System Test Target..
1974 March 1 - . Launch Site: Vandenberg. Launch Complex: Vandenberg 395-C. LV Family: Titan. Launch Vehicle: Titan II. SSTTP M2-31 Target mission - . Nation: USA. Agency: USAF SAC. Apogee: 1,300 km (800 mi). Safeguard System Test Target..
1975 January 10 - . 02:27 GMT - . Launch Site: Vandenberg. Launch Complex: Vandenberg 395-C. LV Family: Titan. Launch Vehicle: Titan II. SOFT - . Nation: USA. Agency: USAF SAC. Apogee: 1,300 km (800 mi). 1975 August 7 - . Launch Site: Vandenberg. Launch Complex: Vandenberg 395-C. LV Family: Titan. Launch Vehicle: Titan II. DG-2 - . Nation: USA. Agency: USAF SAC. Apogee: 1,300 km (800 mi). 1975 December 4 - . Launch Site: Vandenberg. Launch Complex: Vandenberg 395-C. LV Family: Titan. Launch Vehicle: Titan II. DG-4 - . Nation: USA. Agency: USAF SAC. Apogee: 1,300 km (800 mi). 1976 June 28 - . 02:40 GMT - . Launch Site: Vandenberg. Launch Complex: Vandenberg 395-C. LV Family: Titan. Launch Vehicle: Titan II. ITF-1 Target mission - . Nation: USA. Agency: USAF SAC. Apogee: 1,300 km (800 mi). Last launch of a Titan II ICBM (first West Coast launch on 16 February 1963). Demonstrated new Universal Space Guidance System for launch vehicle variant..
1978 August 24 - . Launch Site: McConnell AFB. Launch Complex: McConnell AFB. LV Family: Titan. Launch Vehicle: Titan II. Accident at Titan 2 Silo kills 2 and injures 25 - . Nation: USA. Large scale oxidizer spill during fueling operation caused extensive damage to the silo and resulted in death and injuries. Repairs were started but the silo complex was never returned to alert status..
1980 September 19 - . LV Family: Titan. Launch Vehicle: Titan II. Titan 2 explodes in silo. - . Nation: USA. An Air Force repairman doing routine maintenance in a Titan II ICBM silo dropped a wrench socket, which rolled off a work platform and fell to the bottom of the silo. The socket struck the missile, causing a leak from a pressurized fuel tank. The missile complex and surrounding areas were evacuated. Eight and a half hours later, the fuel vapors ignited, causing an explosion which killed an Air Force specialist and injured 21 others. The explosion also blew off the 670-tonne reinforced concrete-and-steel silo door and catapulted the warhead 200 m into the air. The silo was later filled in with gravel.